Chief Mart's - "Peter Erdnuss"
Based in Luxembourg, Chief Mart's is a band that attempts to combine the spacey psychedelic jamming of bands like Ozric Tentacles with a more down to earth kind of post rock space music typical of bands like Mogwai. Though not always totally successful in blending these styles; they tend to favour either one or the other from piece to piece; they also touch down in a lot of areas in between to tie it together. Their latest disc, Peter Erdnuss, is a delight to listen to. Just listening to the first track Niz Niz gives one an idea of where they're coming from. It's a pure, liquid energetic psychedelic jam, Ozric's style, but with an eerie spaciness to it as well thanks to some wordless, falsetto vocals, reminiscent of early Floyd excursions like Careful With That Axe, Eugene. The next piece, Gnac, falls more into the post rock vein, with a sharply strummed acoustic guitar providing the base for some melancholy electric guitar... but some bubbling synths in the background do keep it on the spacey side. Indeed, each piece has its own distinctiveness to it. Mr. Le Berquot, for example, has a nice jazzy groove to it, with a breezy rhythm section and various members of the band taking solo time. Jean Pierre 1000 is another Ozric's style trip, starting off slow and spacey and building to a furious and heavy freak out at the end. Catt-E-Nom sounds like classic Tangerine Dream filtered through a bad acid trip, and is certainly the weirdest piece on the album. Blue Black Green Boulanger delves deeply into the post rock style once again, stripping away the psychedelic flourishes for what is the rawest track on the album, which builds to a chaotic wall of noise by the end of its nearly 8 minutes. The following track, Seaint, is perhaps the most effective merging of all the styles Chief Mart's is trying to encompass. It's a trippy, sometimes dissonant journey, based more around rhythm and texture than melody. The final track, Opulod 04 takes the band back to an upbeat jazzy style, with a funky organ solo no less, but soon careens off into a jarring and throbbing jam to end things off with. Chief Mart's is usually easy stuff to listen to, but there are enough experimental and harsher sounds to please those who like that kind of thing too, but not so overboard that you can't just sit back and enjoy the music. The band finds a comfortable place between challenging and accessible, between space rock and post rock, that equals some great music. 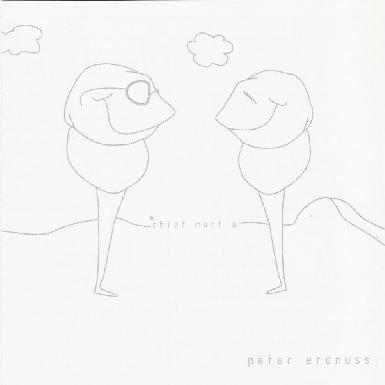 I'm sure Peter Erdnuss, whoever he might be, enjoyed this album immensely. For more information you can visit the Chief Mart's web site at: http://www.chiefmarts.tk.